Świnoujście ranks among the most attractive destinations on the Polish seacoast. Located at the north-western end of Poland, is the only Polish city located on several dozen islands. It is demarcated by the Szczecin Lagoon from the south, the Baltic Sea from the north (the Bay of Pomerania), the German border from the west, and the Międzyzdroje Commune from the east. It is because of its extraordinary location that Świnoujście is a city of many faces – an important maritime economic centre (one of the four key ports in Poland) and a Naval base, but also a popular resort and tourist destination. Świnoujście holds the status of a Commune city, and is one of the largest towns in the Westpomeranian Region. It covers an area of 197.2 km2 and expands its area each year through the sand brought to the beach by sea currents. Although it is commonly said that the city lies on a land of 44 islands, only three of them are inhabited - Uznam, Wolin, and Karsibór. Uznam Island features an administration and services centre and a coastal district with tourist and health resort facilities. It is home to 80% of Świnoujście’s population. What is interesting, only 40 km2 of the island belongs to Poland, while the remaining part, i.e. 380 km2 lies on the German side. Wolin, with an area of 265 km2, is Poland’s largest island. It is separated from mainland by the Dziwna Straits, which forms the flood waters of the Cicha and Madejska Bays, the Kamieński Lagoon, and Wrzosowskie Lake. The part of Świnoujście located on Wolin Island (the districts of Warszów, Przytór-Łunowo, and Ognica) is an industrial quarter. It houses the largest factory connected with the maritime economy and transport junctions, the ferry terminal connecting Poland and Scandinavia, and the railway and bus stations. Here the E-65 international road reaches the sea. The third inhabited island is Karsibór, with perfect conditions for agritourism, angling and water sports. In the northern part of the island the Karsiborska Kępa bird refuge was created. More than 180 hectares are home to about 140 species of birds, including very rare species. The only connection between the islands of Wolin and Uznam is constituted by two ferry crossings. 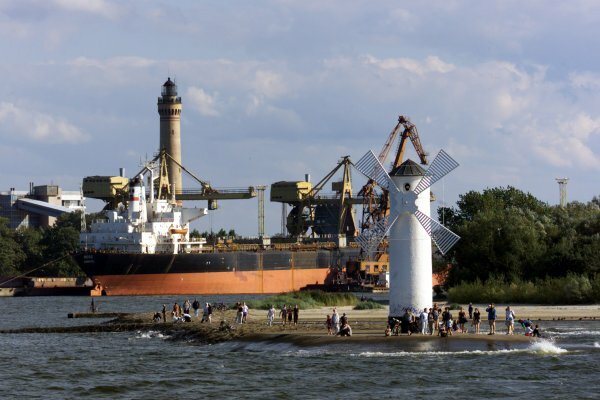 Due to its location, Świnoujście boasts particularly favourable conditions for the development of the maritime economy and tourism. “Here begins Poland”, the residents say of their city. The sea-ferries terminal in Świnoujście provides continuous connections to Sweden and Denmark for passengers, cars, lorries, and railway cars. The terminal is an important link between Central and Southern Europe and Scandinavia. The western and south-western part of the city on Uznam Island borders Germany. Just a few years ago there were two border crossings, Świnoujście-Ahlbeck and Świnoujście-Garz. Polish accession to the Schengen Agreement, the lifting of passport control and the opening of both crossings to car and coach traffic, made the city even more accessible. A UBB train runs between Germany and the part of Świnoujście located on Uznam. On the German side of the island, 12 km from the city there is Heringsdorf Airport. Berlin is only 160 km away, the coast of Sweden just 175 km, and Denmark 150 km.